The recent versions of iMovie have a number of advanced features you may find unusual to be included in an entry-level video editor. You may be even more surprised when you go to look for them since many of the advanced tools are hidden away to keep them from cluttering up the user interface. It's amazing to think that Apple first released iMovie in 1999. That's before OS X was released, meaning the first version of iMovie was designed for the old Mac OS 9. Starting with iMovie 3, the video editor was exclusively an OS X app and began being bundled with Macs instead of being a separate add-on. Two of the most recent versions, iMovie '11 and iMovie 10.x, represent a rethinking of how iMovie should work, with an eye to simplifying the creative process. As you can imagine, this met with cries of anguish and outrage as many people found their favorite editing tools missing, and the workflow they were used to no longer being supported. For the most part, the simplification process was an illusion, with most of the tools still available, just hidden away, because Apple figured most individuals never made use of them. This guide will show you how to access your favorite editing tools in both iMovie '11 and iMovie 10.x. Before we begin, a quick note about the name and version numbers of iMovie. iMovie '11 is the older of the two iMovies we'll cover here. iMovie '11 is the product name and indicates it was included in the popular iLife '11 suite of tools. Its actual version number was 9.x. With iMovie 10.x, Apple dropped the product association with iLife and returned to just using the version number. So, iMovie 10.x is a newer version than iMovie '11. 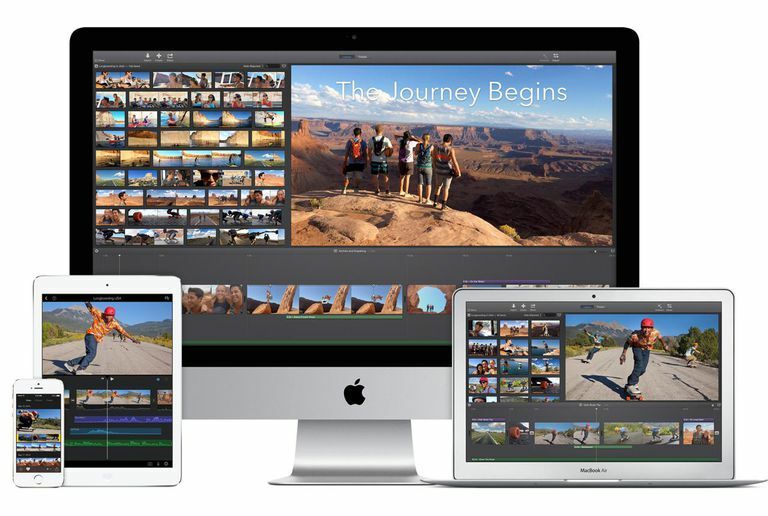 iMovie '11 is a consumer-oriented video editor, but that doesn't mean it's a lightweight. It offers a number of powerful yet easy-to-use tools on the surface. You may not know that it also has some advanced tools under the hood. The most broadly useful advanced tool is keywords. You can use keywords to organize your videos, as well as make videos and video clips easier to find. Among other things, Advanced Tools also let you add comments and chapter markers to projects, use green screens and blue screens to superimpose video clips, easily replace a video clip with another video clip of the same length, and add picture-in-picture clips to a video. To turn on Advanced Tools, go to the iMovie menu and select 'Preferences.' When the iMovie Preferences window opens, put a check mark next to Show Advanced Tools, and then close the iMovie Preferences window. You'll now see a few buttons in iMovie that weren't there before. There are two new buttons to the right of the Horizontal Display button in the top right corner of the Project browser window. A left button is a Comment tool. You can drag the Comment button to a video clip to add a comment, not unlike adding a sticky note to a document. The right button is a Chapter Marker. You can drag the Chapter Marker button to each place in a video that you want to mark as a chapter. The other new buttons are added to the horizontal menu bar that splits the iMovie window in half. The Pointer (arrow) button closes any tool you currently have open. The Keyword (key) button lets you add keywords to videos and video clips, to make it easier to organize them. iMovie 10.x was delivered in late 2013 and represented a complete redesign of the app. Apple again attempted to make it an easier-to-use video editor and incorporated more options for sharing an iMovie via social media. The new version also incorporated many of the themes from the iOS version. iMovie 10 also included picture-in-picture, cutaways, better green-screen effects, and a better method of creating movie trailers. However, just as in the earlier iMovie '11, many of the tools are hidden away to make the user interface easier to navigate. If you open the iMovie 10.x preferences, as I instructed you to do in iMovie '11 (see above), you won’t find an option to Show Advanced Tools. The reason is a simple one; the advanced tools are, for the most part, already present. You'll find them in a toolbar above the large thumbnail image in the editor. You'll find a magic wand that will perform automatic video and audio correction, title settings, color balance, color correction, cropping, stabilization, volume, noise reduction and equalization, speed, clip filter and audio effects, and clip information. You may not see all of these tools at the same time; it depends on the type of clip loaded into the editor. It may seem that some of the old advanced tools, such as green screen, are still missing, but they're present; they're just hidden until they're needed. This practice of hiding some tools unless they're needed helps keep the interface less cluttered. To gain access to a hidden tool, simply perform an operation, such as dragging a clip onto your timeline and positioning it above an existing clip. This will cause a dropdown menu to appear, providing the options for how two overlapping clips should be processed: cutaway, green/blue screen, split screen, or picture-in-picture. Depending on which options you pick, there will be additional controls displayed, such as positioning, softness, borders, shadows, and more. iMovie 10.x does indeed allow you to make use of almost all the same tools as the earlier iMovie '11; for the most part, you'll need to just look around a bit and explore. Don’t be afraid to try moving clips around, dropping clips on top of other clips, or digging into the tools in the toolbar.